CASSILS. “ALCHEMIC NO. 4” (2017). COURTESY THE ARTIST AND RONALD FELDMAN GALLERY, NEW YORK. CASSILS. “PISSED” (2017). 200 GALLONS OF URINE, 18,000 GRAMS OF BORIC ACID, ACRYLIC. COURTESY THE ARTIST AND RONALD FELDMAN GALLERY, NEW YORK. PHOTO: MEGAN PAETZHOLD. CASSILS. INSTALLATION VIEW “MONUMENTAL” (2017). COURTESY THE ARTIST AND RONALD FELDMAN GALLERY, NEW YORK. PHOTO MEGAN PAETZHOLD. Cassils’ artwork revolves around the themes of gender identity, offering a shared experience for contemplating histories of violence, representation, struggle, and survival. They use their body as a living-breathing canvas. 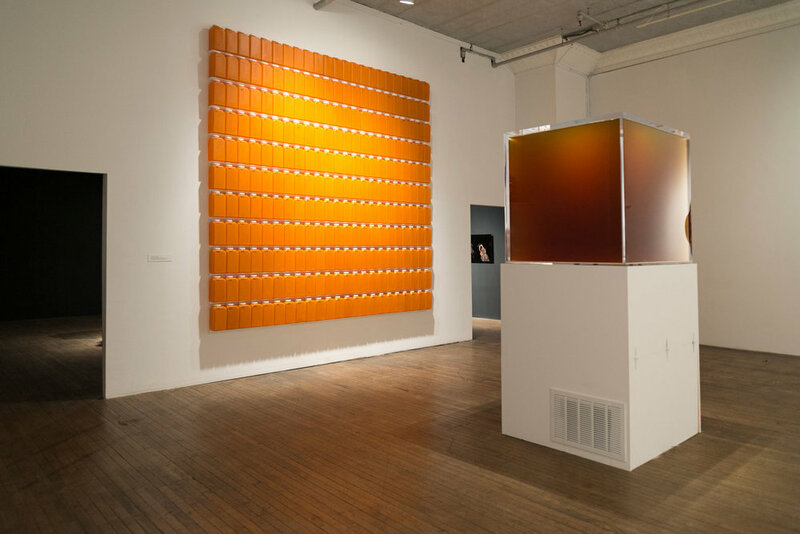 Recently, Cassils closed their solo show MONUMENTAL at the Ronald Feldman Gallery in New York. The show focused on Cassils’ durational performance piece “PISSED”. Displayed inside of a glass cube, the piece contains an accumulation of 200 days worth of piss—every drop of urine that Cassils has passed since the Trump administration’s reversal of President Obama’s protections for transgender students to use bathrooms consistent with their preferred gender identities. “‘PISSED’ serves as a visual representation of how much fluid one person has to litigate as a result of a repressive government,” Cassils tells me. It’s clear to me that Cassils is attracted by art that speaks to the political, but while Cassils aims to create pieces that emotionally impact the viewer, they don’t think all art needs or should aim to do this. Cassils hopes their upcoming works with the COLA Fellowship and their curated performance artist series with Stanford University, titled “Vital Signs,” will be able to take viewers somewhere they’ve never been before. “I’ll be teaching with younger and older artists, and the overarching message of the series will be to teach students ways in which we can use identities as a form of resistance,” they say. Cassils tells me that they have a couple of tricks up their sleeves moving forward, but regardless of what direction their career takes them, creating art has never been an option for them. It’s a necessity.